Do you know your net return? Every decision you make on the farm has an impact on return. Our ROI software calculates your position in real-time. Click on the report below to see a breakdown of what it does. 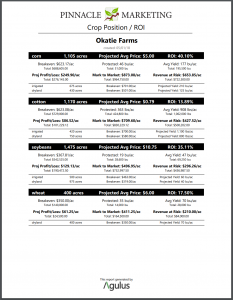 This report is one of many tools we can offer the farmer to track returns and profitability. More informed pricing decisions are made when selling based on profitability.